Iranians take pride in the way they prepare rice. Beautifully cooked and garnished with saffron, it is the most sophisticated and fragrant rice you would ever eat. Each separate grain is so light that you must use a spoon to eat it. 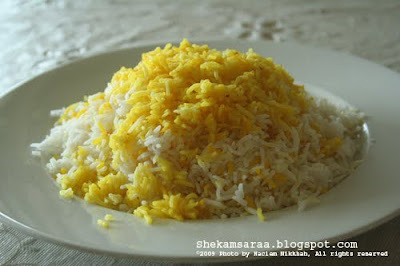 While bread is the staple diet of Iran, no guest will be entertained with at least one dish of fluffy rice. It is believed that rice was brought into Persia, by Turkic tribes from northern India some 2000 years ago. There are five varieties of rice produced in Iran and in order of their quality from the best quality to the round and starchy they are Ambar-boo, Darbari, Dom Siah, Sadri, and gardeh. In Iran Rice is normally purchased in bulks once a year, a year after it has been harvested. Fresh rice is not recommended as it tends to be starchy. Purchasing rice needs some special skills, and it is as serious as purchasing wine. The perfect rice grain must be hard, very long, and pointed at both ends with a nice fragrance and a pale yellow color. When we lived in Iran, my parents would normally examine the rice carefully, and then purchase only about 1 or 2 pounds of the potentially selected rice and test-cook it at home. If they were happy with the result, they would go and purchase a year’s worth of the rice. For Iranians who don’t live in Iran anymore, Basmati rice is the closest rice we can get to the rice we were used to in Iran. Kateh: Is probably the simplest way to prepare rice. Although the result is still delicious, the grains are not as separated as chelow, and therefore it is not very common to serve kateh to guests. Place the rice in a large bowl and cover with water. Agitate gently with your hand and avoid breaking the rice grains, and then pour off the water. Repeat this 3 to 4 times until the rice is completely clean. This way we are trying to extract as much starch as possible in order to get fluffy rice. After washing the rice, place the rice, salt and water in a nonstick pot and bring to a boil over high heat. Then reduce the heat to medium high and bring to a simmer for 10 to 15 minutes uncovered. Until the rice has absorbed most of the water and there’s just a little water at the bottom of the pot. At this point add the butter and oil and using a spatula gently form the rice into a pyramid. Place a dish towel or 3 layers of paper towel over pot and firmly cover the pot with its lid and reduce the heat to low. Cook for 40 minutes. Using a spatula full of rice place it on a serving platter without touching the crust. Mound rice in shape of a pyramid. Then remove the crust and place it on another dish and serve on side. Damy: Is very similar to kateh, except that it is cooked with herbs and vegetables. Chelow: Has the same ingredients as kateh, except that it requires more care during the cooking process, including pre-soaking, partially boiling and then steaming. This results in the fluffiest rice with each grain separated and a crunchy golden crust. If preparing plain rice (not mixed with herbs, vegetables and meet) for guests, it is preferred to use this style of cooking rice. Soak the rice with water and salt for 2 to 4 hours. Add water to a large pot and bring it to a boil. Add the drained rice to the pot. Boil for 6 to 8 minutes, gently stirring with a slotted spatula. The rice must grow and cook, but not overcook. This is the most crucial part of preparing chelow, draining the rice too early or too late will result in either uncooked or sticky rice. Bite a few grains to test the rice. Drain the rice in a large, fine-mesh colander. Make sure there is no grain of rice left in the pot. Put the pot on the stove top again and increase the heat until the bottom of the pot is dry. Add ¼ cup of vegetable oil, and let the oil get hot. Take one spatula full of drained rice at a time and gently place it in the pot, and shape the rice into a pyramid as you go. Poke 4 or 5 holes in the rice pyramid with the handle of the spatula. Add the butter and remaining 2 tablespoons of oil over the rice. Place a dish towel or 3 layers of paper towel over pot and firmly cover the pot with its lid and reduce the heat to low. Cook for 40 minutes. In a bowl, mix 1 spatula of rice with the saffron liquid and set aside. Using spatula place rice on a serving platter without touching the crust. Mound rice in shape of a pyramid. When you have transferred all the rice to the serving platter, spread the saffron rice over it. Then remove the crust and place it on another dish and serve on side. Polow: Is prepared the same way as chelow, except that meat, herbs, and vegetables are arranged in alternating layers with rice to the pot, after the rice has par-boiled. چون فکر کردم شما دوستان خوب فارسی زبانم همان طریق پختن برنج را میدونین، براتون دستور برنج پختن رو ننوشتم. والی اگر خواستید حتما برام پیغام بزارین تا براتون دستور پخت برنج ساده رو بنویسم. This was simply a fabulous recipe and I so appreciate the preciseness of your information! It was also beautifully perfect!! !